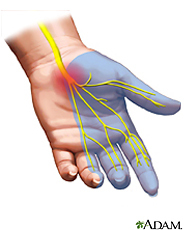 Carpal tunnel syndrome is compression of the median nerve due to thickening of ligaments, tendons, or other structures or swelling which cause narrowing in the carpal tunnel region at the base of the hand. Resulting symptoms consist of pain, weakness, or numbness in the hand and wrist, and radiating up the arm. Symptoms may awaken the patient at night and are typically confined to the thumb, index, and middle fingers. Bilateral carpal tunnel syndrome can occur in endocrine and metabolic disorders. It involves thickening of the transverse carpal ligament, which compresses the median nerve. Nocturnal paresthesia is a frequent complaint with bilateral carpal tunnel syndrome, which is partially relieved by shaking the hands. Bilateral symptoms such as in this condition indicate a red flag, and the clinician should proceed with an extensive screening for medical diseases. Carpal tunnel syndrome typically produces symptoms that originate in the hand and radiate up the arm in contrast to thoracic outlet syndrome, which produces pain in the neck and shoulder that moves down to the hand.